Born in French Algeria into a poor family in 1913, Camus lost his father in the Battle of the Marne in 1916. He was raised by his mother, who worked as a charlady and was illiterate. Winning a scholarship, Camus eventually began a career as a journalist. As a youth, he was a keen footballer as well as being a member of a theatrical troupe. From his time as a goalkeeper, Albert Camus always had a team spirit. He had a generous, if sensitive nature, and always sought the maximum unity, seeking to avoid or bypass rancour. Many intellectuals writing about Camus have obscured his support of anarchism. He was always there to support at the most difficult moments of the anarchist movement, even if he felt he could not totally commit himself to that movement. Camus himself never made a secret of his attraction towards anarchism. Anarchist ideas occur in his plays and novels, as for example, La Peste, L’Etat de siège or Les Justes. He had known the anarchist Gaston Leval, who had written about the Spanish revolution, since 1945. Camus had first expressed admiration for revolutionary syndicalists and anarchists, conscientious objectors and all manner of rebels as early as 1938 whilst working as a journalist on the paper L’Alger Republicaine, according to his friend Pascal Pia. The anarchist Andre Prudhommeaux first introduced him at a meeting in 1948 of the Cercle des Etudiants Anarchistes (Anarchist Student Circle) as a sympathiser who was familiar with anarchist thought. Camus also supported the Groupes de Liaison Internationale which sought to give aid to opponents of fascism and Stalinism, and which refused to take the side of American capitalism. These groups had been set up in 1947-48, and intended to give material support to victims of authoritarian regimes as well as exchanging information. Supporters included the Russian anarchist Nicolas Lazarevitch, exiled in France, as well as many supporters of the revolutionary syndicalist paper La Révolution Proletarienne. Camus remained a friend and financial supporter of RP until his death. He ends with a call for the resurrection of anarchism. Authoritarian thought, thanks to three wars and the physical destruction of an elite of rebels, had submerged this libertarian tradition. But it was a poor victory, and a provisional one, and the struggle still continues. Gaston Leval responded in a series of articles to the book. His tone was friendly, and he avoided harsh polemic, but he brought Camus to book on what he regarded as a caricature of Bakunin. Camus replied in the pages of Le Libertaire, the paper of the Fédération Anarchiste (circulation of this paper was running at 100,000 a week in this period). He protested that he had acted in good faith, and would make a correction in one of the passages criticised by Leval in future editions. The general secretary of the Fédération Anarchiste, Georges Fontenis, also reviewed Camus’s book in Le Libertaire. To the title question “Is the revolt of Camus the same as ours?”, Fontenis replied that it was. However he faulted him for not giving due space to the revolutions in the Ukraine and Spain, and for portraying Bakunin as a hardened Nihilist and not giving credit to his specific anarchist positions. He ended by admitting that the book contained some admirable pages. A review by Jean Vita the following week in Le Libertaire was warmer and more positive. These measured criticisms from the anarchists were in contrast to those from the fellow travellers of the Communist Party, like Sartre and the group around the magazine Les Temps Moderne. This marked the beginning of Camus’s break with that other great exponent of existentialism. The criticisms of this group were savage, in particular that of Francis Jeanson. Camus replied that Jeanson’s review was orthodox Marxist, and that he had passed over all references to anarchism and syndicalism. “The First International, the Bakuninist movement, still living among the masses of the Spanish and French CNT, are ignored”, wrote Camus. For his pains, Camus was “excommunicated” by Jeanson from the ranks of the existentialists. These methods disheartened Camus. He also received stern criticism from the Surrealists for the artistic conceptions within the book. It looked like the anarchist movement were Camus’s best supporters. Camus marked this break in other ways too. He had made a pledge to himself to keep away from intellectuals who were ready to back Stalinism. This did not stop him from wholeheartedly committing himself to causes he thought just and worthwhile. In Spain a group of anarchist workers had been sentenced to death by Franco. In Paris a meeting was called by the League for the Rights of Man on February 22nd 1952. Camus agreed to speak at this. He thought it would be useful if the leader of the Surrealists, André Breton, should appear on the podium. This was in spite of the attack that Breton had written in the magazine Arts, over Camus’s criticisms of the poet Lautreamont, admired by the Surrealists as one of their precursors. Camus met with the organisers of the event, Fernando Gómez Peláez of the paper Solidaridad Obrera, organ of the Spanish anarcho-syndicalist union the CNT, and José Ester Borrás, secretary of the Spanish political prisoners’ federation FEDIP, asking them to approach Breton without telling him that Camus had suggested it. Breton agreed to speak at the meeting even though Camus would be present. Gómez then told Breton that Camus had suggested he speak in the first place, which moved Breton to tears. Later Camus told the Spanish anarchists that because he had not replied to Breton’s anger in kind that a near-reconciliation was possible. Camus and Breton shared the podium and were even seen chatting (for Breton and the Surrealists links to the anarchist movement see here). Camus took a position of the committed intellectual, signing petitions and writing for Le Libertaire, La révolution Proletarienne and Solidaridad Obrera. He also became part of the editorial board of a little libertarian review, Témoins 1956., getting to know its editor, Robert Proix, a proofreader by trade. Camus, via Proix, met up with Giovanna Berneri (Caleffi) the companion of the gifted Italian anarchist Camillo Berneri, who had been murdered by the Stalinists in Spain in 1937. Camus also met Rirette Maitrejean, who had been the erstwhile companion of Victor Serge, and had been involved in the Bonnot Gang affair and trial. Rirette had been working as a proofreader for the paper Paris-Soir for a long time. Camus also became a friend of the anarchist veteran Maurice Joyeux, who was later to remark that of all contemporary literary works The Rebel was the book that most closely defined the aspirations of the students and workers in May 1968. Again in 1954 Camus came to the aid of the anarchists. Maurice Laisant, propaganda secretary of the Forces Libres de la Paix (Free Forces of Peace) as well as an editor of Le Monde Libertaire, paper of the Fédération Anarchiste, had produced an antimilitarist poster using the format of official army propaganda. As a result he was indicted for subversion. Camus was a character witness at his trial, recalling how he had first met him at the Spanish public meeting. Camus told the court, “Since then I have seen him often and have been in a position to admire his will to fight against the disaster which threatens the human race. It seems impossible to me that one can condemn a man whose action identifies so thoroughly with the interests of all men. Too few men are fighting against a danger which each day grows more ominous for humanity”. It was reported that after his statement, Camus took his seat in a courtroom composed mainly of militant workers, who surrounded him with affection. Unfortunately Laisant received a heavy fine. Camus also stood with the anarchists when they expressed support for the workers' revolt against the Soviets in East Germany in 1953. He again stood with the anarchists in 1956, first with the workers’ uprising in Poznan, Poland, and then later in the year with the Hungarian Revolution. Later in 1955 Camus gave his support to Pierre Morain, a member of the Fédération Communiste Libertaire (the Fédération Anarchiste had changed its name in 1954 following rancourous struggles within the organisation). Morain was the very first Frenchman to be imprisoned for an anti-colonialist stand on Algeria. Camus expressed his support in the pages of the national daily L’Express of 8th November 1955. Camus often used his fame or notoriety to intervene in the press to stop the persecution of anarchist militants or to alert public opinion. In the final year of his life Camus settled in the Provence village of Lourmarin. Here he made the acquaintance of Franck Creac’h. A Breton, born in Paris, self-taught, and a convinced anarchist, he had come to the village during the war to “demobilise” himself. Camus employed him as his gardener and had the benefit of being able to have conversations with someone on the same wavelength. One of the last campaigns Camus was involved in was that of the anarchist Louis Lecoin who fought for the status of conscientious objectors in 1958. Camus was never to see the outcome to this campaign, as he died in a car crash on 1960, at the age of forty-six. This is all quite interesting but i dont think one should go too far down this slippery road and imply that Camus was in any way an anarchist. Camus accepted the Nobel Prize in Literature in 1957. Not exactly a typically anarchist thing to share the common bourgeois fascination for prizes and awards, or is it? But to me, its definitely Camus' position on Algeria that is really not compatible with any anarchist thought or behaviour. Camus was always in favour of French Algeria and was therefore a supporter of colonialism. He may have been born in Algeria, but he was thinking more like a Frenchman, or rather like a colonialist one rather than an anarchist one. Edward Said showed quite well in his book Culture and Imperialism how Camus' writings are inscribed within the dominant tradition of French writings, notably on the point of imperialism. As far as Algeria is concerned, national independence is a formula driven by nothing other than passion. There has never yet been an Algerian nation. The Jews, the Turks, Greeks, Italians, or Berbers would be as entitled to claim the leadership of this potential nation. As things stand, the Arabs do not comprise the whole of Algeria … The French of Algeria are also natives, in the strong sense of the word. Moreover, a purely Arab Algeria could not achieve that economic independence without which political independence is nothing but an illusion. (cited by Said, 1993 p 179). 'A purely Arab Algeria could not achieve economic independence'. How about that for racism? Yeah, right Albert, they soooo need the help of some Western civilization. It reminds me of some of the views Marx held on India and the English presence there. Im not denying that he was an interesting and commited writer with anarchist sympathies and all that, Im just saying the whole thing should not be pushed too far. Camus is part of the establishment in France nowadays. I think thats for a reason. Not sure I agree with you Nico on the points on employing an anarchist gardener or accepting a literature prize (fair enough, I wouldn't accept it but that would just be to add to my edgy intellectual cool, I don't think there's anything bad in it.. same if some anarchist football player made it big and won the World Cup, I wouldn't expect him to hand his medal in after the game..). That said, your point on Camus and colonialism is fair (I'd not heard that before).. at the same time, you can't just write off any contradictory ideas someone has as making them 'more Marxist than anarchist'. What about Kropotkin's support for WWI? Bakunin's actions in the First International? The CNT joining the Republican government in the Spanish Civil War? They all remained anarchists, while also supporting pretty stupid (and ultimately quite dangerous) ideas.. I'd agree with you that Camus was more 'anarchist-leaning' than an outright anarchist but I think its unfair to align him with the 'Marxist tradition' in the most pejorative sense of the word just coz we don't like certain things he said or did (its also odd considering the positive contributions to the working class of many Marxists - anarchists have no monopoly on being consistant revolutionaries, same way Marxists have no monopoly on being twats..). I'd also warn against rejecting Camus because he has largely been recuperated by the French establishment. Of course some of it is because of the reactionary elements of his work, but equally it is because the liberatory elements have been ignored as well. Every radical political and artistic movements up til now have been recuperated to some extent, from feminism to expressionism to socialism.. the point is not to reject these things wholesale but to draw out the most useful bits, the bits which put themselves in confrontation with capitalist society (obviously though, this doesn't mean whitewashing out the parts we find uncomfortable). In taking what is useful we can also reject what is useless, and in rejecting what is useless we are creating constantly a living movement, free from ideological dogmas, for the creation of communism..
Also, I think the point about "economic independence" is fair enough, and I don't see how you can paint it is racist. That's just bollox about Franck Creac'h and Camus. They had a warm friendship, one of equals. People really should actually investigate these things before coming out with holier than though comments. Not read this yet, but it looks highly interesting..
"Carroll, David. Albert Camus the Algerian: Colonialism, Terrorism, Justice. New York: Columbia University Press, 2007. .... David Carroll's new book on Camus is an important contribution not only to Camus studies but to contemporary reflections on postcolonial theory. The book is a model of scholarship and erudition, and it is also the record of a personal change in point of view. After reading the attacks on Camus's politics that branded him a "colonialist sympathizer" (in their different ways, Albert Memmi, Conor Cruise O'Brien, and Edward Said enact this form of criticism in their respective studies), Carroll set out to re-read Camus and to discover for himself the degree to which these attacks and criticisms could be called justified, the degree to which they were grounded in a serious and nuanced reading of Camus's writings - both the journalistic essays and the fictions that deal primarily with Algeria. Not the least of the many qualities displayed in Albert Camus the Algerian is the intellectual honesty of its author. Whereas Carroll demonstrates, convincingly as far as I am concerned, that O'Brien and Said were off the mark in their attacks (and essentially, that they did not read Camus), his purpose is not, however,... "
An anarchist and another in an employer-worker relationship?Well if it isn't any exploitation involved is ok I guess. Just kidding. Your first post here on libcom. Hope you don't mean to go on in the same way you have started. Rania, could you say a few words on Camus and Elytis? While you have to be cautious with intellectuals and there political positions Camus and his support for Anarchism partial or otherwise should be welcomed. The main ramparts of his philosophy were the individuals duty to resist oppression and to be as honest as possible in whatever you do.These positions are consistent with Anarchism and at least he had the courage to make a stand for our comrades and break with Satre and Stalinism. In response to Varlet, this idea of him being a colonialist is a common misconception of Camus; in fact, Camus was one of the few Algerian/French intellectuals who consistently called for the equal rights of Arabs in Algeria. 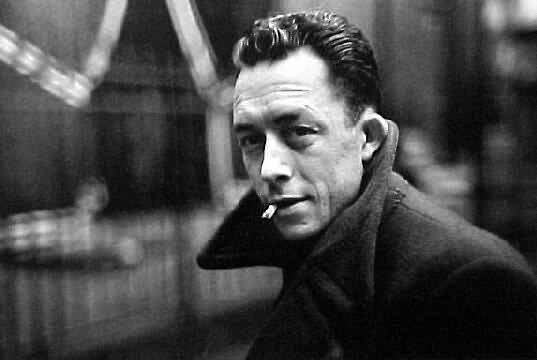 I would argue that, considering his working class origins and his tendency to self-identity as both a Frenchman and an Algerian, Camus was extremely conflicted over the nationalist movement in Algeria, especially a movement that, while highly sympathetic in its rebellion against racist French leaders, also used terrorist tactics that killed innocents, a revolutionary move he would naturally despise considering his opposition to the death penalty and murder in general. Camus, I would argue, was trying desperately to find a middle ground for the working class French men and women who lived in Algeria and the nationalists who wanted them gone. If he was not successful in this, he at least tried to not take a Marxist position, like Sartre, that would support strict nationalism and terrorism. His short story The Guest is an exploration of this as well. Albert Camus is one hundred today! I innocently procured Caligula (the 1970s film starring Malcolm McDowell) last night after someone recommended the Camus work to me, I hoped for a film adaptation of his play. Oh dear, you should have checked first. I think Camus is a great writer, and has interesting things to say. But on the crucial test of Algeria, and the FLN and the national struggle against French Imperialism, he was on the wrong side, while Sartre was right.